Probably inspired by the recent and unfortunate demise of the ‘Scrabulous’ word game on Facebook, I came up with another variant version of the original board game, based on a fusion with a popular version of poker. For the most part, it is the same as normal; rules on scoring of letters, how words can be placed, and so forth remain. The big difference is that there are three face-up tiles beside the board. People can use any combination of their seven tiles and the three tiles to make a word on the board. Once the three letters are down and everybody has seven of their own, a three minute timer is started. Whoever can come up with the highest scoring word then gets to place it on the board. Players can use pads of paper to write down possible words and their corresponding scores, if desired. The same person can theoretically go time after time, replacing their own letters and the three upward facing letters every time a word is placed. Normally, each player subtracts the value of their remaining letters from their score, when the first player runs out of tiles and can draw no more from the bag. (Also, if a player manages to use all seven of their letters in their final turn, they get to add the value of everyone else’s tiles to their score.) A fairer system, for this variant, might be to require that a player use all remaining upright tiles, as well as their own, to earn the bonus from the remaining tiles of others. [Update: 6 August 2008] Tonight, Gabe, Emily, and I played the first ever game of Scrabble Hold-Em. The experience made it clear that a few rules needed to be refined. There are two variants to the game. In one, the three upright letters in the ‘hold’ change every time a word is put down, getting randomly exchanged for others in the bag. In the other version, only letters used to form words are replaced from the bag. Players choose which version they want to play before the game begins. In the event that two people have words of equal value, the word with the highest value letter will win (like a high card in poker). If the highest letters are tied, the second highest are used, and so forth. If all letters are tied, a coin will be flipped. A one minute time limit makes for a very hectic sort of game. Overall, this game made me feel more as though this could be a good variant upon the original game. It would be excellent if other people could try it and leave comments here. Does any word of 7+ letters count as a bingo? Or any word using all 7 from your hand (and 0-3 of the extras)? I would suggest that players need to use all ten letters to get a ‘Bingo’ and the fifty point bonus that accompanies it. Duplicate Scrabble has some similarities to this. I suppose most people know rather more seven letter words than ten letter words. Even so, scores in this variant would probably be much higher. In the first place, people could choose from among more letters. In the second place, the strongest player may put down many more words than others. That being said, it is possible that very strong players would do worse in this game. Bingos are apparently critical to tournament play, and might be rarer with ten letters than with seven. 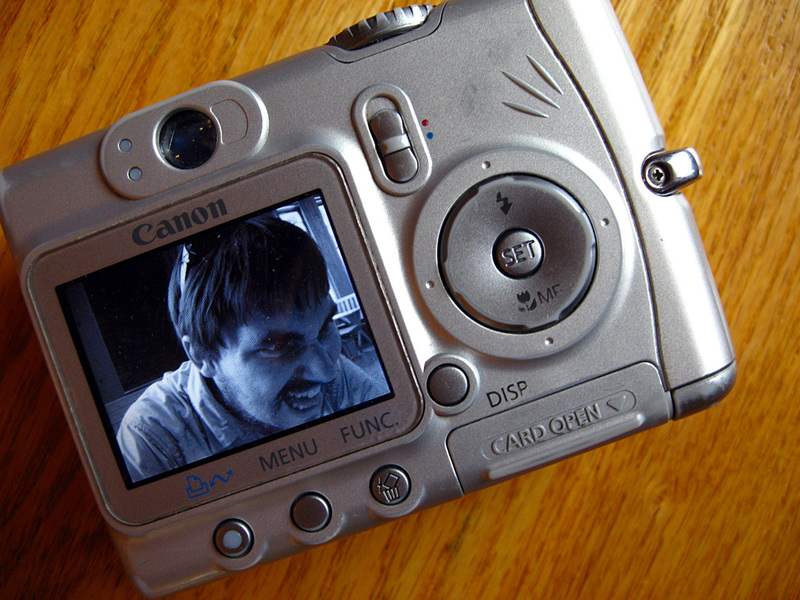 Finally, we captured the spirit of Milan’s sinister doppleganger inside a Canon Powershot A510.. This post describes my transition from my much-loved A510 to the Image Stabilized A570. You should try speed-scrabble too. It involves no board. You divide all letters between the number of people playing (2-3 is best), and each person turns up 7 tiles. Then the game begins and each player scrabbles to place all the letters in their pile in the form of actual words before their competitors finish. Each player has their own ‘board’ and as in real scrabble words have to link into each other. You can only turn up more tiles from your pile once the number of unplaced letters drops below 7, but you are allowed to re-arrange letters already placed as more letters are revealed, so you can have more than 7 un-placed letters once the game gets underway. As the aim is to finish first, rather than score words, words tend to be short and unusual, but dictionary rules of course still apply. New people in poker rooms can always experience something fascinating and something annoying. We pray others would bite the bate when we play slow. All the above is a natural thing for us. Only after we experience the unexpected, the emergency that may not come up in the books, can we learn to be calm. Coz then we are old fish. P.S. if YOU have any further intention of knowing about Texas Holdem, please visit raidbet as your best guide.